This original musical, created by Michael Bush, Michael Aman, and Joel Silberman, is about the evolution of American music and American attitudes, which began to coalesce at the beginning of the twentieth century. It features songs by Irving Berlin, George M. Cohan, George and Ira Gershwin, and others. The show, co-produced by George Street Playhouse, has already garnered rave reviews. 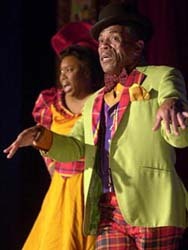 André De Shields plays Bill, a character based on early African American stage performers, particularly Bert Williams, who was the first black Broadway star. Michael Bush directs. Marla Schaffel, who plays Irene in this show, won the Drama Desk, Outer Critics Circle, and Drama League Awards, as well as a nomination for the Tony, for her portrayal of Jane Eyre on Broadway. We sat down with Marla and the creative team after the preview matinee on Sunday. They had a lot to say. Read on. The Rep invited "American Idol" aspirants to participate in an event called "Let ME Sing." The winners, in order, were Allison Modafferi, Beth Pierce, Pamela Moses-Snipes, and Johanna Jowett. Allison did "It's a Privilege to Pee" from Urinetown and Beth did a number from Love, Janis. Of particular note among the other contestants were Lisa Dames and Heidi Woodward.